Pina Colada Squares and Giveaway Winner! If you’re even half as ready for Spring as I am, you’re doing everything you can to make it happen sooner than later. One thing I like to do when it’s cold out, is make something tropical and delicious to help me think of warmer temperatures. 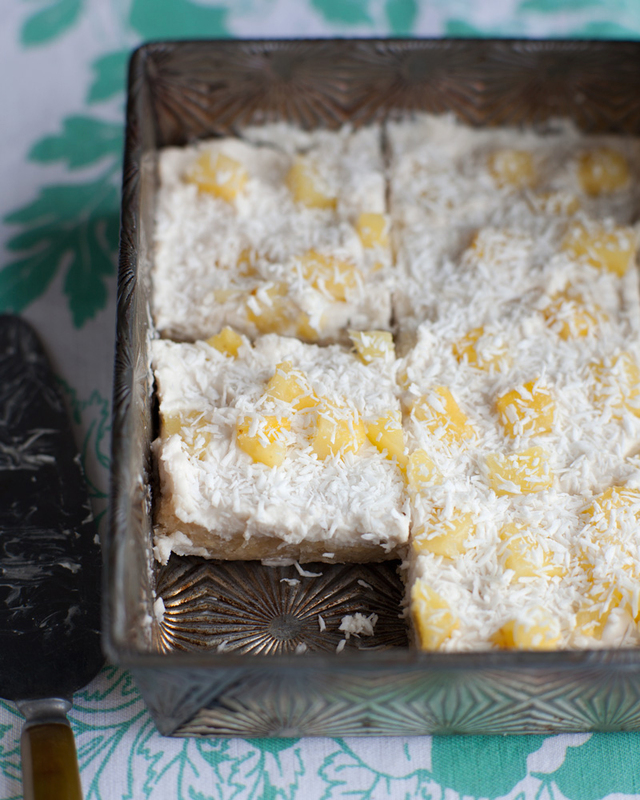 These Pina Colada Squares do the trick. I adore the combination of coconut and pineapple, and a little splash of rum doesn’t hurt either. I hope you enjoy these tasty treats as much as I do. They’re simple to make and the recipe comes from my book Vegan Without Borders — you all have that book now, right? If not you can buy it here — you’ll be glad you did! Before I share my recipe for Pina Colada Squares, I’d like to announce the winner of last week’s giveaway. The winner (chosen at random) of Ricki Heller’s new book, Living Candida-Free, is: Marika whose favorite sugar-free dessert is Mango Sorbet made with mango and banana — yum — and congratulations! Marika: Please email me with your address so we can get a copy of the book right out to you! These treats aren’t too sweet if you use unsweetened coconut. Alternatively, you can substitute 2 to 3 tablespoons of sweetened coconut for part of the unsweetened coconut and omit the confectioners’ sugar. If you don’t have dark rum, use 1/2 to 1 teaspoon rum extract and make up the rest of the liquid (to equal the 1 tablespoon) with pineapple juice or a little water or almond milk. 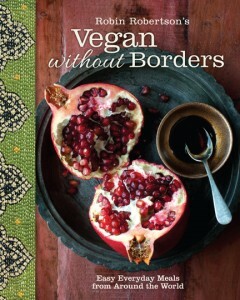 This recipe is from Vegan Without Borders by Robin Robertson © 2014. Published by Andrews McMeel Publishing. Note: Be sure you use dried pineapple pieces to make the bottom layer (not fresh or canned) or it will be too wet. To make the bottom layer, grease an 8-inch square baking pan and set aside. In a food processor, combine the dried pineapple, cashews, oats, coconut, confectioners’ sugar, and rum. Pulse to chop, then process until finely chopped and well combined. The mixture should hold together easily. Press the mixture evenly into the prepared pan. Set aside. To make the top layer, combine the cream cheese, confectioners’ sugar, rum, coconut extract (if using), and 1/4 cup of the shredded coconut in a food processor. Process until smooth and creamy. If the mixture is too thin, add a little more confectioners’ sugar and process again. Spread the topping mixture evenly over the bottom layer. Sprinkle the top with the pineapple chunks and the the remaining 1/4 cup coconut. Cover and refrigerate until ready to serve. Cut into squares. I could use some tropical food right now. I’m so over winter. This looks so delicious and sunny. Thanks! This sounds awesome! Has anyone ever tried these all natural cookies from http://www.cooperstreetcookies.com ? They are great if you have any dietary restrictions but don’t want to give up on desserts! Best part is you can eat them guilt-free!